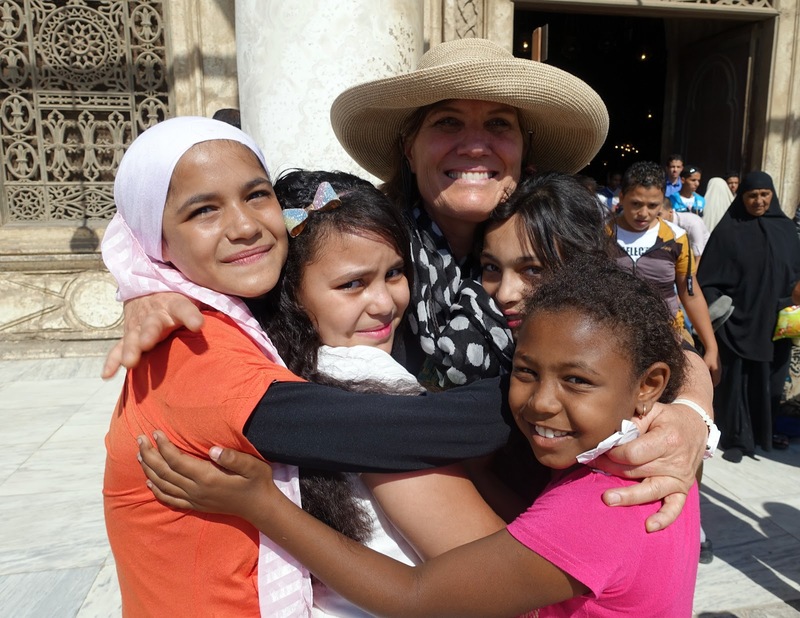 Outside a mosque in Cairo, Egypt some girls became my friends. We walked together for an hour, laughing and learning from one another. I liked how they were so open with me, a stranger to their land. I didn't want to leave their presence. They made me laugh and pulled my heart a little bigger that day. Meet my good friend, Duaa. She is smart and beautiful. As I was writing this blog, I heard a doorbell ring. She was asking to borrow some matches to light some candles for her parent's anniversary. I gulped. I admit even a tear came as I told her my theory of growing up: that we have to learn to love those next to our elbows before we go save the world. Hopefully, if we are lucky, like Dua and me, we have wonderful parents to show and demonstrate how to love. I ran over to her house to see the decorations. There were fifteen red balloons that represented 15 years of marriage for her parents. I hugged her, and told her someday she is going to do great things with all this love she has in her heart. And I gave her mom a hug too. "Un femme que aime transforme la monde." Translation: A woman with love can change the world. I love being a girl, a woman, a sister, a mother. I also love meeting with young girls in my travels. I have five sisters, two daughters, about fifty nieces (yes, not exaggerating), and many young girls whom I consider my friends and mentors. Sometimes I look back when I was 15 and can still feel the pangs of wanting to grow up and do something out of the ordinary--even extraordinary. Oh, and of course, let us not forget the wish to be beautiful.... The way to quiet the stresses and stabs of adolescence? I propose it is to not think too much about ourselves. "When I don't think about myself too much, when I can look outside of myself, I look much prettier. The women that I find beautiful are those who are relaxed with themselves. People who are open are beautiful. People who show emotions on their faces are beautiful. A face that is quick to laugh or to cry, a vulnerable person is beautiful. You don't have to be born with a great bone structure." Amen! Somehow that simple observation from an unknown model was my adolescent mentor. I crossed a bridge the day I read it. I was free. I had permission to not worry too much what I looked like to others. If she, the glamorous model, thought people were beautiful when they were open, relaxed, and didn't think about themselves too much, then this was my aim. I felt this goal was attainable. I decided to practice on the people under my roof first--to start thinking about them more--not just myself. And predictably, my love for them swelled. Meet Chloe, my niece, who spearheaded a family art exhibit this summer at my mom's house. She knew everyone was sad after my dad died, so she gathered everyone together. We brought paintings, drawings, art projects, sculptures. We stood in awe at everyone's efforts. We laughed and praised one another. But Chloe made it happen. A special memory was made because she knew her family was in need of some cheer. As a young teenager, I longed to travel, do humanitarian work, teach, write, and have a family of my own. Yet, as I have become older, I have learned to appreciate the two people that shaped me most: my parents. They insisted through our daily family rhythms that I must first learn to love and serve at home. And then, and only then, would I be effective with my dreams of going out to the world. I inwardly agreed because had not the beautiful, anonymous model revealed her secret? Reaching out and looking outside of ourselves was the answer. Sometimes, I fear, in our (at least my) accelerated pace to go out and save the world, we might forget our sibling or grandmother at our elbow. Maybe there is someone who needs to be listened to in the next room. Perhaps someone needs some validation and love. The relationships within the family prepare us to be perceptive, give attention and time when it is not convenient to our personal schedule--to forgive when our feelings are stung. As James E. Faust said, "Serving others can begin at almost any age. . . . It need not be on a grand scale, and it is noblest within the family." Within those walls at home, all the teaching of loving, giving, sharing, helping distills on us drop by drop. We have learned to love. And then when we want to go out and open the sky, we are ready to tackle the world. As Busset says, "a woman who loves can change the world." Home is where it starts. Young girls and one young boy in Qatar giving gifts in their best clothes for Eid, a traditional Muslim holiday. I love the two mothers looking on. I am sure the children were well instructed. Meet Sara, with my son. They have been friends since they were crawling babies. Sara's family has showed her that she can accomplish much, even though she has Down's Syndrome. Sara is the eighth of ten children, and has been raised with lots of love. "Le Lumiere c'est la vie. Por lo tanto quanto mas luz en las pictures mas vide, mas truth, and mas belleza." -- Joaquin Sorello (translation: The light is the life. Therefore, more light in pictures is more life, more truth, and more beauty. Once in a while in my wanderings or browsing, I find a new artist, musician, or author that formally has escaped my view. How could I have never known of them? Their works shed new insights that bring tender emotion and understanding to me. Suddenly, the world is different somehow by being exposed to the beauty of their creations. It is like an experience when a new friend or even a person whom you have known for a long time can suddenly teach you things you never supposed. My lesson? One can never estimate or expect that you know the full breadth of anything or anyone. Just around the corner, there is often a chance to be astonished by joy. This is exactly what happened to me on a recent trip to Madrid, Spain. I had never been to Madrid or even Spain before. Everyone speaks of the Prado and the Reina Sofia to see El Guernica. With the abundance of museums in Madrid, no one had mentioned Joaquin Sorella and his home and studio that was transformed into the Joaquin Sorella Museum (You can watch the youtube on the site about his house and life). I had never heard of him before. Yet, as I researched him more, I realized I had seen his pictures at the J. Paul Getty Museum in Los Angeles. But I had just walked by. But this time in his light-filled studio, with his home and garden surrounding it, I stood at attention. Sorella was a new inspiration. 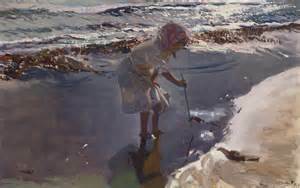 His pictures of light, the ocean, and people playing on the beach with infused sunlight brought back a sense of wonder and memories for this San Diego, California girl. Also, his attention to transient moments of time captivated me. 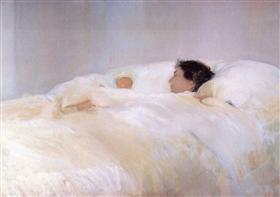 Some examples are a mother and child in bed, as the mother gazes deep into her new child's eyes. I could relate to that one. I have known that awe. 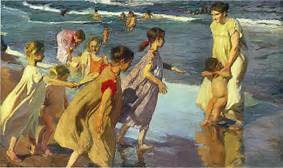 The bonds of friendship and quiet whispers as the waves crash on the ocean, with the summer sunlight warming your shoulders and back. Yes, I too have known that bond in conversation many times as the tide engulfs our feet. Sorella's many pictures of the playfulness of children in the water and sand show moments of time that return to us as adults again and again--whether we are the children or the children we have loved. Are not all our lives a string of moments? Sorella captures in a dazzling way moments of love, friendship, and the carefree moments of childhood--all arrayed in splendid light. 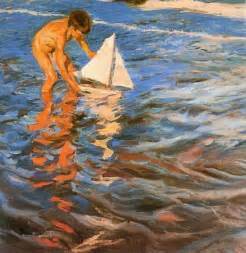 In fact, most of the children he painted were his own, as he stood close by painting the moments he wanted to remember, to etch in him. Discovering a new treasure, like Sorella, I never tire of the finding. Sometimes it is in the most unlikely of places. Sadly, Sorella is not known much outside of his native Spain. 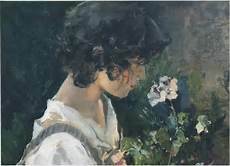 His passion for painting and light permeates me. I want to remember the quote from him when I paint because it is something that I very much believe: "Just see the picture that is coming." There is no navigable way to paint. 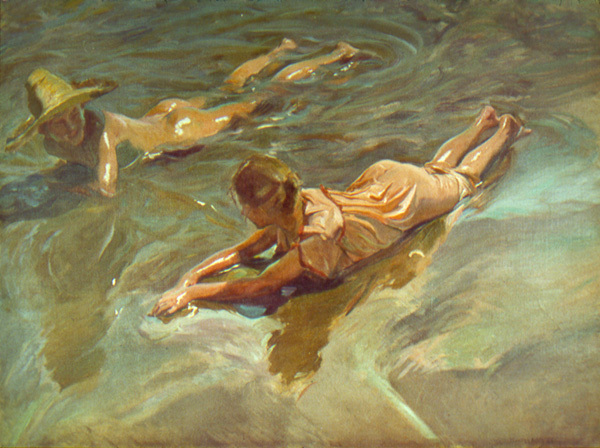 It is an ongoing, flowing river. You follow it and see where it leads. The light will lead the way. And finally, to live every day for the moments that enrich our lives. They are the very fiber of a life well lived. Al, my neighbor, on the first day of Eid, when he was at the Mount of Arafat in Saudi Arabia on August 31, 2017. Muslims believe that Mount Arafat was where creation began with Adam and Eve. It is known as the Mountain of Mercy. 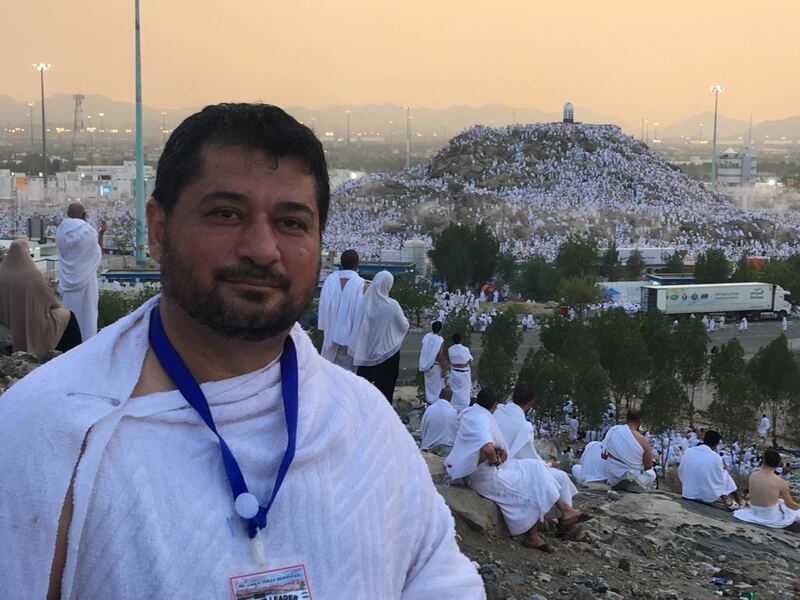 The common meaning of Arafat is "to know' because it is the place where people come to pray all day until sunset--for God to hear their faithful supplications to be freed from their sins. It is a time to get "to know" themselves and think about their ultimate time with Allah. Muslims believe that it is a place that resembles what it will be like on the Day of Judgment. At Mount Arafat all are supposed to be alike unto God--equal and without any socioeconomic classes. Everyone wears two pieces of white clothing that are simply pinned together and then wrapped around them. This is the same kind of simple clothing that Muslims will wear when they are buried. Over three years ago we came from the US as expatriates to live in Doha, Qatar. I had briefly lived in the Middle East as a college student before so to hear the minarets calling out to pray five times a day was not particularly unusual to me. Frankly, I enjoyed the punctuated and predictable rhythm that it added to my life. To see passerbyers fall to the ground to pray along the road when they heard the imam call to pray was not just curious or interesting to me. Instead, I felt humbled, changed somehow, by observing their worship. Their earnest devoutness has caused me to reflect on my own sincerity of prayers. And to see my friends come from their Hajj causes me to wonder about the need for constant self-renewal in all of us. I have been blessed to have friends here who have not merely allowed me a visual lens to watch from afar. But they have taken the time to share their tender feelings and experiences about their faith of Islam. I have been moved and touched. They have helped me understand the world a little better--my own world and the world we all live in. I was given a Quran by my neighbor that has much truth. I always tell them how lucky I am to have come across the world to be their neighbor. My neighbors, a family with six children, have brought their kids twice to Mecca in the last three years. I asked them if I could take their picture when I dropped them off at the airport to go to there. 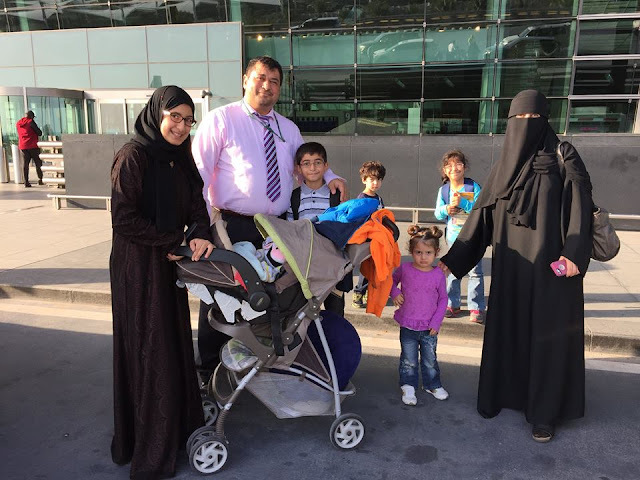 When my friend, Abeer, came home from Mecca and Medina, with great emotion and love, told me how she prayed for my family as she walked around the Kaaba. As I celebrated my Christmas with my children and family, I prayed for her too. How grateful I am that she has let me into her spiritual thoughts and prayers! Hajj is the largest annual gathering in the world. There are over two million people who descend on Saudi Arabia from about 70 countries since one fourth of the world's population is Muslim. It is the required fifth pillar of Islam, as long as you are financially and physically able to make the trek. Most people have prepared all their lives to supplicate and submit themselves before Allah. It lasts five to six days. The reward is self-purification--cleansing oneself from past sins and taking on a deeper commitment to Allah. The traits the pilgrims promise and renew are to have unconditional obedience, and to exhibit simplicity, sacrifice, tolerance and charity. 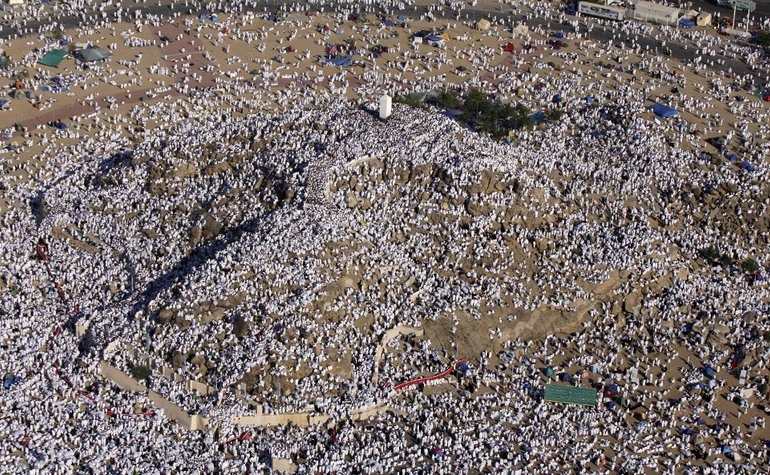 Pilgrims at Hajj at Mount Arafat. 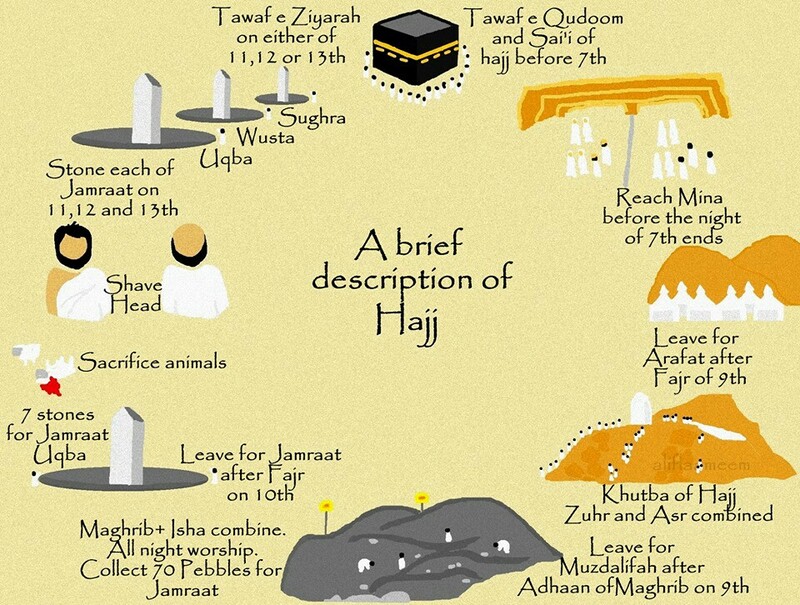 Arrival: When everyone arrives from all over the world, they enter into a state of holiness or Ihram. Each pilgrim, all two million or more of them, must cleanse themselves and put on the proper attire. They promise to bring peace and abstain from anything that would not make them holy for Hajj. 1st day: Everyone is reminded of the prohibitions they promised to upon arriving. Everyone goes to the make tawaf or to make their initial prayers when they come. It is like a welcome prayer. Afterwards, the pilgrims walk/run slowly around the Kabba, where they circle it counter clockwise seven times. If you cannot kiss the stone of Abraham because of the large crowds, you point to it. Some of the children reenacting circling the Kaaba, even some of them with the wrapped around apparel. 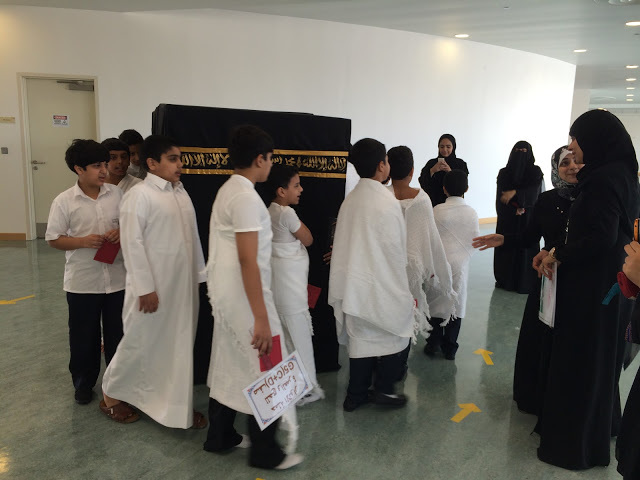 At the school the kids reinact the circling of the Kaaba. 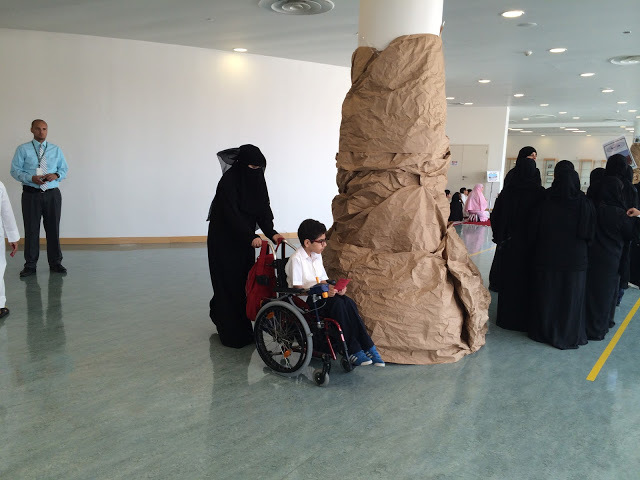 At the Kaaba in Meca, they have a special circle for people with disabilities. 2nd day: On this the holy day at Mount Arafat, the pilgrims arrive before noon to supplicate and atone for their sins. All the pilgrims gather around Mount Arafat to join in prayers for forgiveness. Pilgrims are not required to fast on this day, but Muslims all over the world fast on this day for their own purification. As it says in the Quran, "There is no day on which Allah sets free more souls from the fire of hell than on the Day of Arafat. And on that day Allah draws near to the earth, and by way of exhibiting his pride remarks to the angels, 'What is the desire of these servants?'" 3rd day: The next day the pilgrims throw rocks at one column, slaughter an animal to remember Abraham and Ismael, and the men shave their heads to show further supplication. They go back to Mecca that night, which shows a symbolism to be in a hurry to obey God. Although traditionally the pilgrims slaughtered the animals to remember Abraham and Ismael, they sign a form when they come to give money to slaughter an animal somewhere in the world. 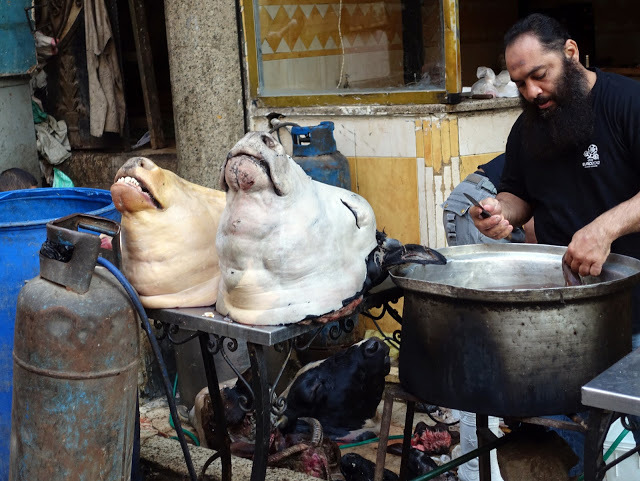 Below is from my trip to Cairo during Eid. 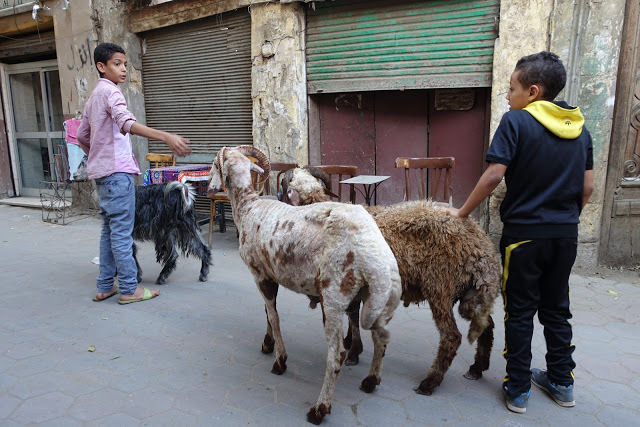 On a trip to Cairo in 2014 at Eid, I was interested to see the signs and preparations of Eid all around us. All around the world during those special three days, Muslims prepare for Eid. They pray, and slaughter the animals. 4th day: Following the tawaf ziyarat prayers at Mecca, the pilgrims come back to Medina to throw seven more pebbles on the three pillars. From noon to sunset, the pilgrims throw the pebbles again. If they don't leave that night to go back to Mecca, they continue to throw the pebbles again the next day. 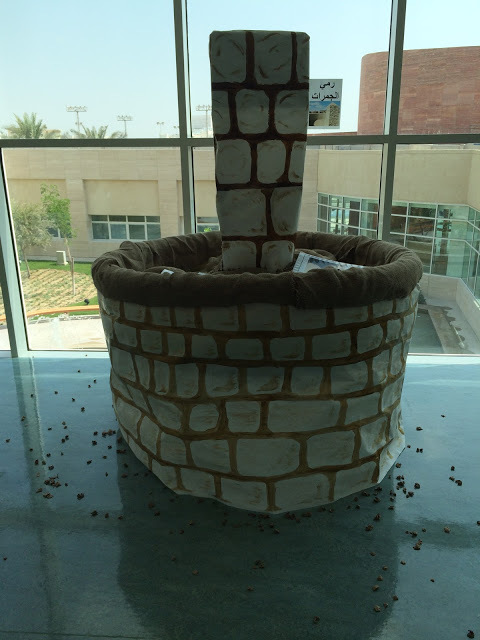 This is a pillar the children reenacted when I went to a school in Qatar. They threw crumpled up balls of paper, as the pilgrims threw stones to the devil. 5th day: The pilgrims must throw stones again--purging their souls from sins of the past. 6th day: On this day the pilgrims gather from all over the world to say farewell. They exchange greetings and gifts, knowing they have set out what they said they were going to do. It is called Tawaf al-Wada. Sometimes if some of them want to go to Medina, the birthplace of Mohammed the Prophet, they go there too after the Hajj. I love this picture of when I went next door to talk to Abeer, and I saw the poster she made for Al--welcoming him home from Hajj. When they invited me in, I could see white balloons everywhere, symbolizing a renewed, pure, cleansed life. I thought Al was already great. But he seems even happier than the neighbor I knew before. I love to see the pride his children have in him because he went to Hajj. Al, my neighbor led a group of people for several weeks during the Hajj. He had been 17 years ago in 2000 before he and Abeer were married. But he said he wanted to do it again--to view the journey of life through a different lens. He wanted to be a better husband, father, and Muslim. 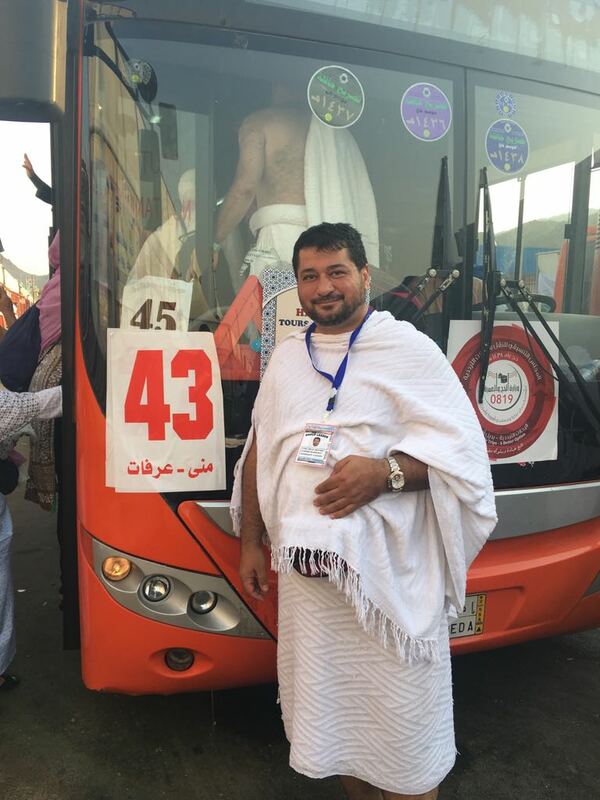 He told with great excitement of some of the days of his pilgrimage--particularly the Mount Arafat experience. He told me how hot it was that day, how they were dripping with sweat in Saudi Arabia at the end of August. But then he said, in the afternoon, a remarkable miracle to took place. Clouds drifted in to cover the blazing desert sun, and a cool breeze blew by for everyone. He knew Allah was there, close to them, cleansing them and purifying their hearts. Listening to Al, I was touched by his radiant countenance and his family's pride in his journey to Mecca. Tirmithi, a Muslim states, "The feet of man will not slip on the Day of Resurrection until he has asked five things: of his life as to how he spent it, his youth as to how he used it, his wealth as to where he got it and how he spent it, and of his knowledge as to what he did with it." Those are questions we all need to answer--no matter what faith we are or what country we are from. To reflect on our own kind of pilgrimage and take the time to evaluate our intentions is good for all of us. To go a little deeper in our reflections of the path we are treading is needful for the soul.